R. Buckminster Fuller’s influence on science fiction films and television during his lifetime (12 July 1895 – 1 July 1983). 1960. Film. Directed by Kurt Maetzig. Based on the novel The Astronauts by Stanisław Lem. An international rocket crew finds geodesic domes on the planet Venus. 1971. Television. Directed by Tom Gries. A space station makes a claim for independence from the Earth it orbits. R. Buckminster Fuller is credited as the “Technical Advisor for Earth” in Earth II. Fuller’s Dymaxion Map is used to track orbiting satellites in an Earth-bound control room. 1972. Film. Directed by George Roy Hill. Based on the novel Slaughterhouse Five by Kurt Vonnegut Jr. Billy Pilgrim is kept in a geodesic dome in a zoo on the planet Tralfamadore. 1972. Film. Directed by Douglas Trumbull. The spaceship Valley Forge includes several geodesic domes. 22 September 1973 – 5 January 1974. Television. Directed by Leo Orenstein. Created by Harlan Ellison. Executive Producer was Douglas Trumbull of Silent Running. A geodesic dome from the spaceship Valley Forge from Silent Running is re-used on the spaceship The Ark. September 17, 1978 – April 29, 1979. Television. Created by Glen A. Larson. The geodesic dome from the spaceship Valley Forge from Silent Running which had been re-used on the spaceship The Ark in The Starlost is re-used once more on an Argo Ship. This dome is on exhibit at the EMP Science Fiction Museum between 23 October 2010 – 4 March 2012. He was born in the 1800s. He conducted an extensive survey of world resources although he was not formally trained to conduct such a task. This survey of world resources demonstrated to him that the profit motive was getting in the way of the efficient and humanitarian distribution of goods and services. He advocated fully-automated factories, and wrote about energy consumption as the most accurate measure economic value. He was Howard Scott. He was born in the 1800s. He crossed paths with Technocracy Inc. He wrote about the closest packing of circles. His mathematical work was not in essay form but in poetry. His work was ignored while alive but has influenced many (with and without credit) since his death. He was Frederick Soddy. He was born in the 1800s. He was an inventor not only of a particular artifact for which he is well known for one, but more importantly of a new method of manufacturing and distribution. He wrote books on creating buildings so large entire cities could be housed inside, and the use of round houses laid out on hex-grid streets. He supported global economic reform based on technological competence rather than profit so that all human needs could be met at no cost to the recipient. He was King Gillette. He was born in the 1800s. He invented a map of the world that received a United States patent. This map displays all continents in an uninterrupted way. The map can be folded into a globe. He designed a domed building. He was Bernard Cahill. He was born in the 1800s. He became an inventor from an early age, a practice that never left him. An early death in his family also never left him. He investigated alternative fuel sources, innovative new toilets and octahedron-tetrahedron truss structures as an architectural form. Scientific discoveries have been named after him long after his death. He was Alexander Graham Bell. 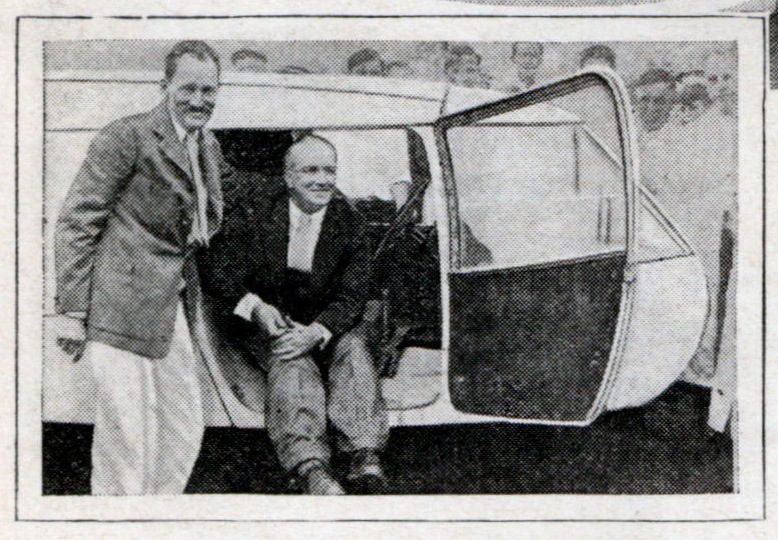 Starling Burgess and R. Buckminster Fuller, Dymaxion Car. Modern Mechanix Magazine October 1933. 1895 Richard Buckminster Fuller was born. 1910 Richard Buckminster Fuller Senior, Fuller’s father, died. 1917 Fuller married Anne Hewlett. 1933 Fuller completed Dymaxion Car #1. 1938-1939 ‘the main system of general education instruction to go on the air and screen’ according to Fuller’s book Nine Chains to the Moon. 1938 Roger Hewlett wrote a poem for Fuller titled One Chain to a Room. 1940 Fuller vacationed with Christopher Morley and conceived the Dymaxion Deployment Unit. 1957 a United States Marine Corps dome was lifted by helicopter from the deck of the USS Leyte. 1957 Fuller received an honorary doctorate from Washington University in St. Louis, Missouri USA. 1966 Fuller lectured at a NASA Symposium at Southern Illinois University Institute of Technology in Carbondale, Illinois USA. 1967 the Montreal Biosphère was dedicated by Fuller to Anne as a wedding anniversary gift. 1969 the first Public World Game was played in New York City, New York USA. 1970 Fuller received an honorary doctorate from Columbia College in Chicago, Illinois USA. 1974 Matthew Meyerson wrote a haiku for Fuller in the Synergetics Cookbook. 1976 Fuller received and honorary doctorate from the University of New Mexico. 1980 John Cage wrote a poem about Buckminster Fuller. 1984 a commemorative exhibit titled In Memoriam R B F was shown in Singapore. 1999 Your Private Sky: R. Buckminster Fuller edited by Joachim Krausse published. 2000 Ron Campbell performed Buckminster Fuller: The History (and Mystery) of the Universe at the Lorraine Hansberry Theater in San Francisco, California USA. 2003 the Artaud Theater in San Francisco hosted a Buckminster Fuller birthday tribute. 2004 the US Postal Service issued a stamp honoring Buckminster Fuller. 2008 Bucky’s Ge-Odyssey presented by The Center for Architecture Foundation in New York City, New York USA. 2016Trevor Blake published Buckminster Fuller Bibliography.